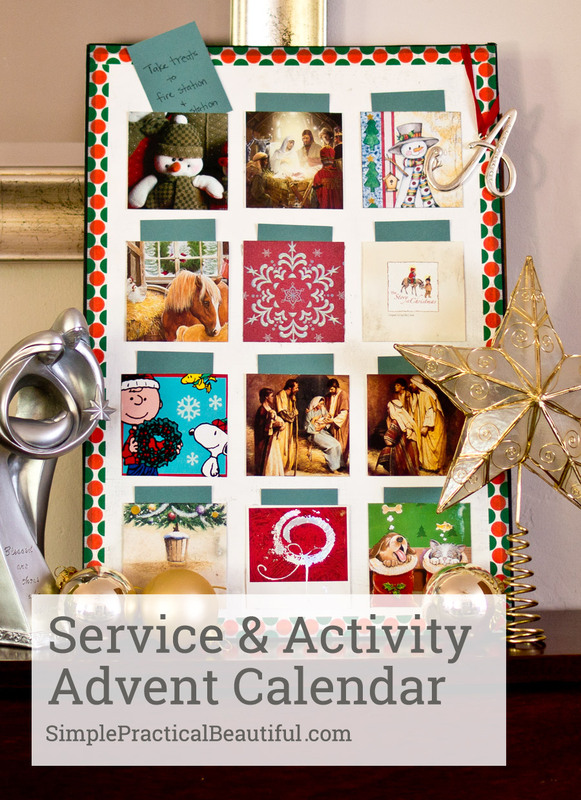 The countdown to Christmas starts in a few days, so I’m sharing the advent calendar my family uses to make December more about service and giving to others with a few “just for fun” activities thrown in. 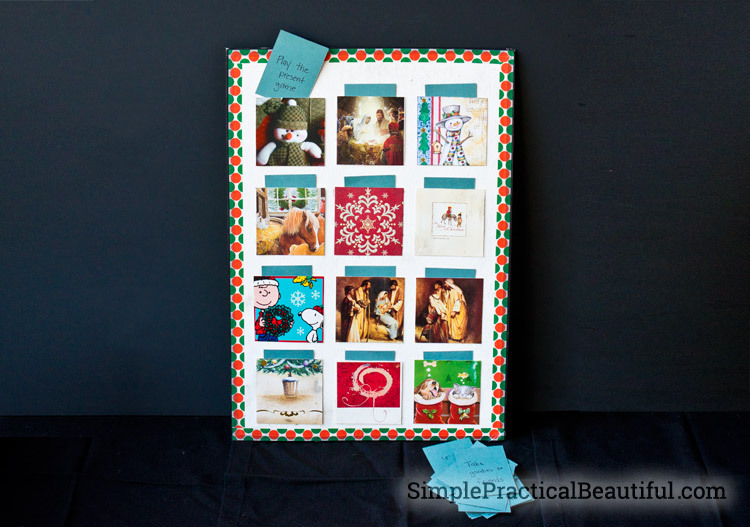 I love the idea of advent calendars counting down until the big day, but I don’t have the time to make one each year, and I definitely don’t have the spare cash to buy one. Plus, stuff is my nemesis, so I don’t want a new trinket each day. 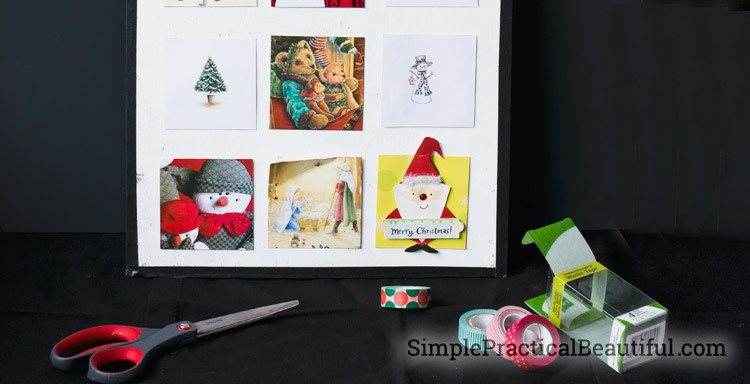 A few years ago, I decided to make a reusable advent calendar that focused on activities instead of toys or trinkets. To make our advent calendar, I took a piece of mat board (which is a little thicker than cardboard) and cut it fit in our Christmas storage box, 12 inches by 18 inches. I quickly painted it white with some old wall paint and added a border around it with black masking tape. The masking tape has since started peeling off, so this year I added a washi tape border around each side. It fixed the peeling tape and made the advent calendar look a little more festive. 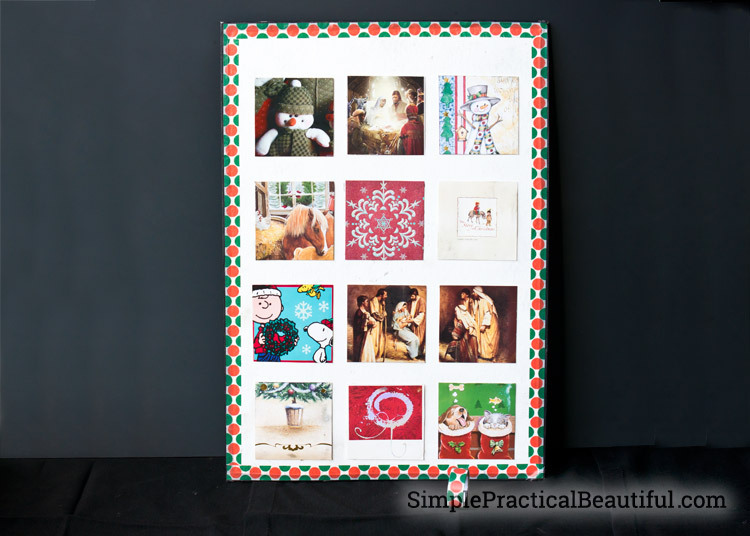 I cut old Christmas cards into 3-inch squares. 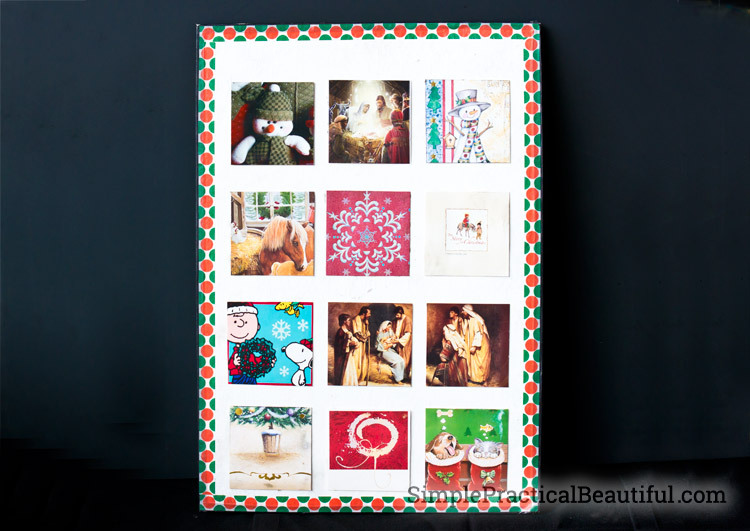 There are 24 squares, 12 on each side, so that we count up to, but not including, Christmas. I figured we are too busy Christmas morning to think an advent calendar. 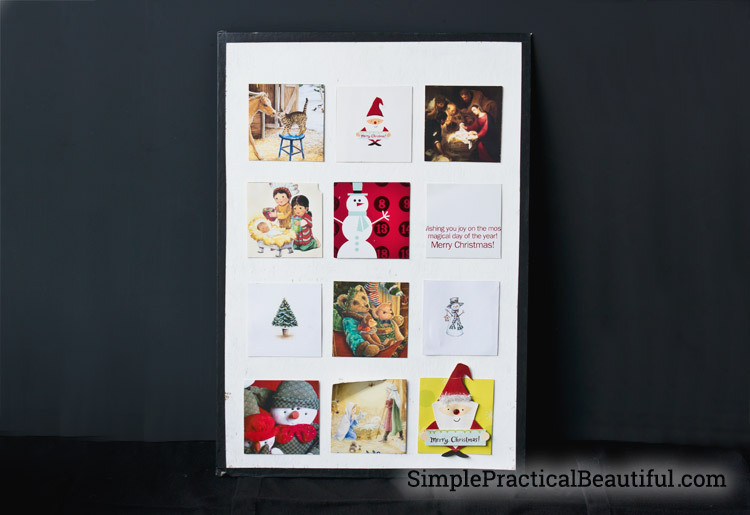 I glued each square along 3 sides with a glue gun. Glue gun glue is thick, so it made nice pockets. I cut out a lot of 3 by 2 1/4 inch rectangles from a neutral blue cardstock paper. I wrote an activity for each day on the rectangles. 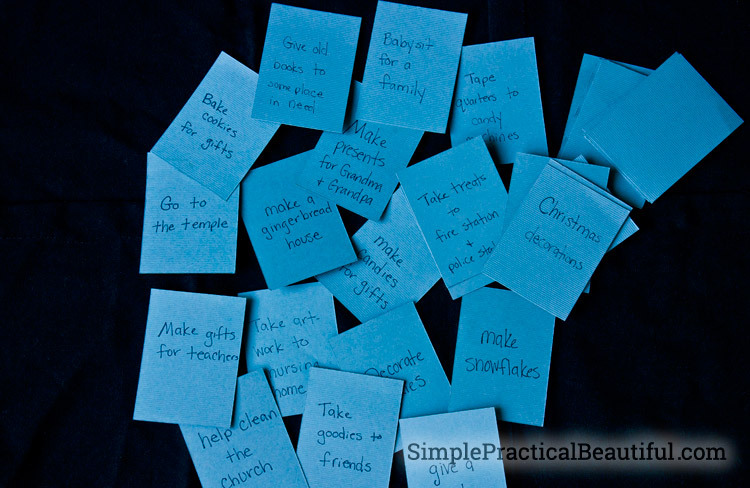 When my kids were smaller, the activities were things like “Read a Christmas book” and “Play the present game” (where we practice receiving gifts and saying thank you–they loved it). Now I try to include more service activities. You can download our list of Christmas activities by clicking on the list here. Every year, after we discuss which activities we’d like to do, I sit down with our calendar and figure out which activity should happen on which day. 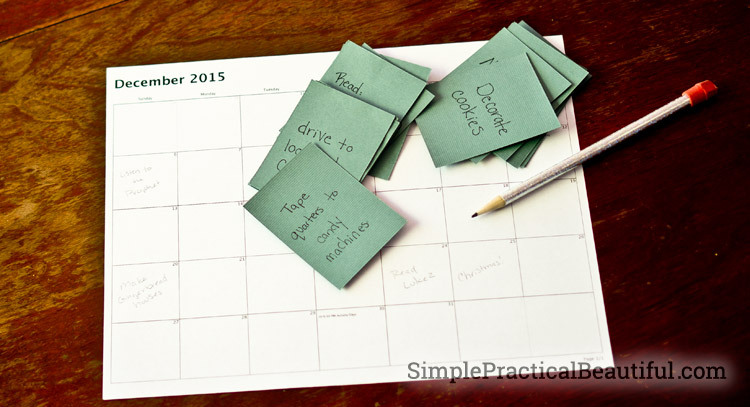 The busier the day, the simpler the activity. And because I decide when different activities will happen, my kids are excited to find out what the activity will be each day. Our advent calendar is pretty simple each year, but it has helped us to focus more on giving and remembering the true meaning of Christmas. Thanks Keri. I have to admit, even this feels like too much sometimes, but this calendar helps me to make sure I’m spending quality time with my family and we are focusing on what matters most.